At the very heart of the Scottish FA’s performance strategy are the seven Performance Schools that have been operating since 2012 focusing on supporting the development of Scotland’s best young footballing talent. 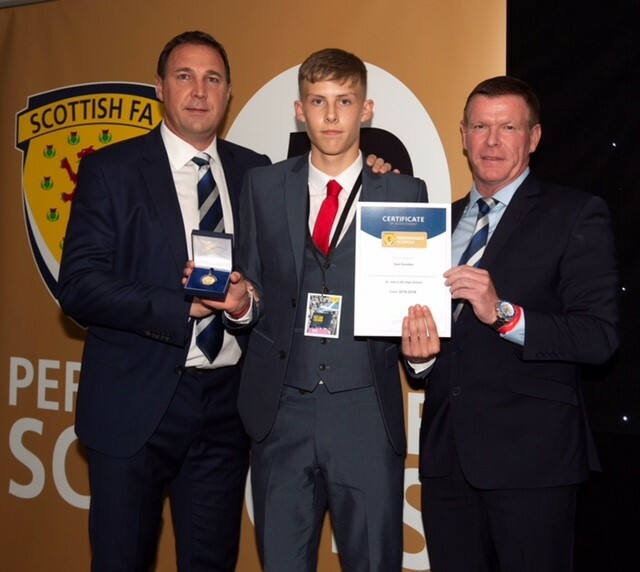 Recently, 15-year old Kyle Sneddon graduated from the SFA Performance School at St John’s High School in Dundee. Kyle is now in his third season playing for Fife Elite Football Academy and of course regularly played for Cowdenbeath’s under-20s in the second half of last season. He scored an equalising header against Forfar Athletic up at Station Park; he was the youngest player on the park at just 15 years old that evening. A versatile player, Kyle can play centre or right midfield but has previously and comfortably played centre half or right back. Kyle’s previous clubs include Dundee United Youth Academy and AM Soccer Club in Cupar where he began his football journey. At Kyle’s graduation ceremony at Hampden Park he became one of the very first FEFA players to graduate from the Performance School. He attended the SFA Elite Performance School at St John’s High for the 4 years of the Performance programme. The Performance Schools programme is designed to give talented boys and girls, those with the best potential to develop their abilities, the opportunity to practise football everyday within an educational environment. Each of the Performance Schools in Scotland runs a programme in partnership with the Scottish FA for boys and girls within the S1 to S4 age groups. Every year, each school selects a number of the most talented under-12 players to join the programme. This provides the most talented young footballers throughout the country with an extra 800 hours of coaching. Each school has its own full-time elite youth coach who has overall responsibility for the delivery of the programmes. At St John’s that coach is ex-Cowdenbeath assistant-manager Iain Jenkins. Jenks coached and guided Kyle for the 4 years he attended St John’s. Kyle greatly enjoyed working with Iain on a daily basis and gained a tremendous amount of knowledge and footballing experience under Iain’s tuition. Kyle has now returned to Madras College in St Andrews this summer to go on and sit his Highers.